Death Jan 9, 1835 Pownal, Bennington Co., VT, USA, age 1y. 18 d.
Sarah Cady married Orville Spencer in May 22, 1847. Orville Spencer married Sarah Cady, daughter of Ira Cady and Betsey Locklin, in May 22, 1847. Eunice Cady married Jason Dorr Houghton, son of Thomas Houghton and Betsey Parker, in Sep 28, 1852 at Granville, Addison Co., VT, USA. Lucy E. Cady married Peter Hatch in Nov 16, 1868. Peter Hatch married Lucy E. Cady, daughter of Ira Cady and Betsey Locklin, in Nov 16, 1868. Samuel Keyes married Lucy E. Cady, daughter of Ira Cady and Betsey Locklin, in Sep 15, 1872. Alonzo J. Cady married Margaret J. Long in Jan 3, 1866. Margaret J. Long married Alonzo J. Cady, son of Ira Cady and Betsey Locklin, in Jan 3, 1866. Jonathan Cady married Ida Keyes in Jan 2, 1873. Ida Keyes married Jonathan Cady, son of Ira Cady and Betsey Locklin, in Jan 2, 1873. Joel Moore Cady married Jessie Adams. Jessie Adams married Joel Moore Cady, son of Ira Cady and Betsey Locklin. 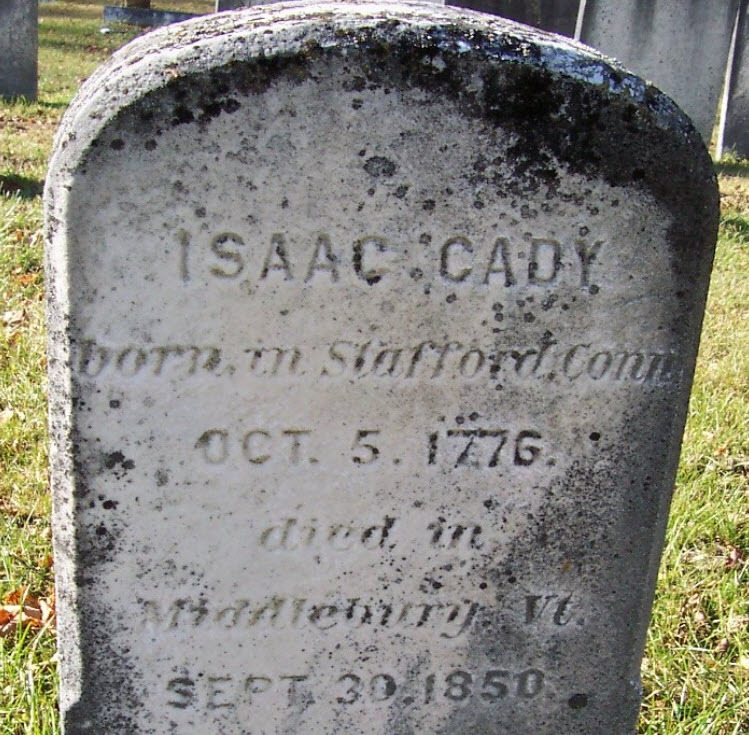 Isaac Cady Jr married Eunice Houghton, daughter of Abraham Houghton and Sarah Divol, in Oct 16, 1788 at Kingston, Granville, Addison Co., VT, USA, Remmey: Alstead, NH. Eunice Houghton married Isaac Cady Jr in Oct 16, 1788 at Kingston, Granville, Addison Co., VT, USA, Remmey: Alstead, NH.